A few weeks ago I stumbled upon a website called Readitswapit. It was recommended in a book on money saving tips as a place where you can swap books with other members, so the only cost involved is the postage. One the surface it seems like a good idea, especially for book clubs, as many people post the most current popular fiction up there. I thought I would give the website a go and see if it is worth it. One of the most inspirational authors of all time in my opinion is Paulo Coelho. 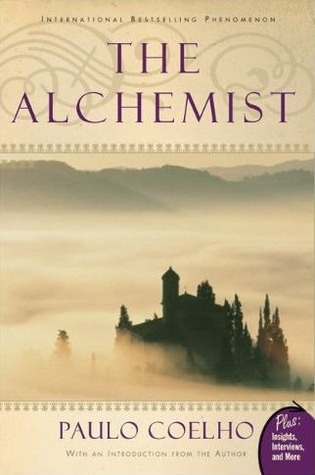 I have a particular fondness for his book “The Alchemist”; it is full of spiritual inspiration, positivity and motivation. “The Alchemist” was one of those books where I couldn’t put it down for long and I am a slow but avid reader which meant this was two days’ worth of reading for me and I found every word spectacular and poetic. I think perhaps this book touched me because I have always believed in the theory of cosmic ordering, working with the universe by changing your personal thought processes into a more positive structure – surrounding yourself with aspirations and motivational comments, reflecting on the good things in your life and trying hard to forget the bad things or at least, prevent the bad things from becoming the forefront of your mind. These are just a few of the many wonderful words written in the book “The Alchemist” by Paulo Coelho and from what I’ve heard (though haven’t yet read) that his many other books are also filled with the same inspiring prose as this all-time classic. I do endeavor to read more of Paulo Coelho’s books soon, when I do, I am sure to update my findings here. This book spiritually changed me for the better and set me on a new path in life, I truly recommend this book for anyone who is losing faith in the world around them (by faith I am not talking religion but by faith in human nature or faith in the universe looking out for you). So how can you judge me, just because I’m not like you? Would you like it if I said, you’re better off dead, because you have blond hair? Would you ignore my harmful chants if I said that you looked gay? Would you ever feel the same again, after the things I’d say? So how can you judge me, for the way I am? How can you past judgement to a stranger on the sand? So why do you feel the need to always correct me for being me? Why do you need to make life more difficult, by your comments and your stare?